King of Thrones - We treat you like royalty. Event Comfort Station / Outdoor Toilet Rentals - We treat you like royalty. King of Thrones (portable toilet) station rentals are luxurious, high-end portable rest rooms. You can rent these clean, odor free, private and comfortable environments for your next meeting, wedding, celebration, gathering or remodeling project. King of Thrones comfort stations are typically dropped off 1 day prior to your event. The units are delivered and fully configured for your event, so you won’t need to do a thing. After your event we pick up the unit, working around timing that works best for you. Gender specific washrooms - the “Queens” have 2 flushing toilets and the “Kings” have 1 urinal + 1 flushing toilet. King of Thrones provides our royal service to many areas in the Durham Region, Clarington, GTA and surrounding areas. A few of our high voloume service areas are listed below, but we're flexible so feel free to contact us if you don’t see your area listed below. 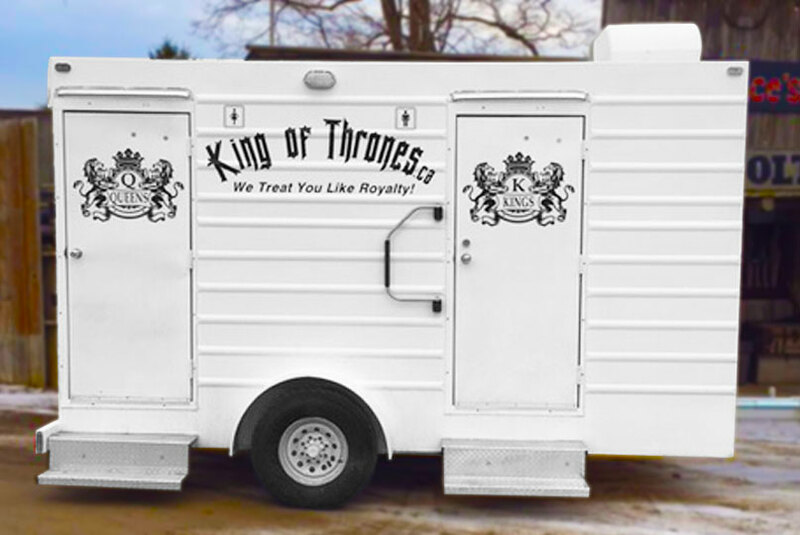 King of Thrones (portable toilet) comfort station rentals are perfect for every kind of event. From small gatherings to large events, these units can handle up to 250 guests per day and will make sure to provide your guests with a royal experience when nature calls. © 2016 King of Thrones.